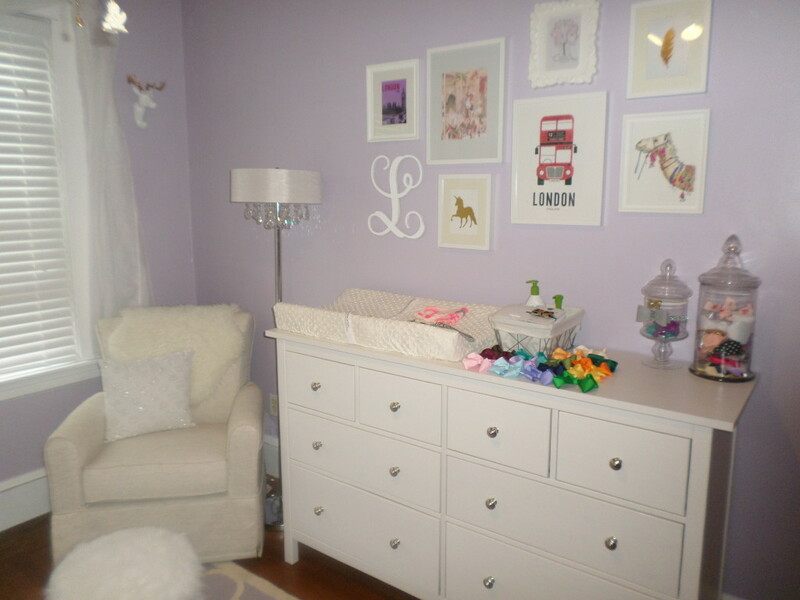 London's purple nursery is very white and bright as are most rooms in my home. It is very girly with some different wall prints and accents. I wanted something dreamy and very feminine. My inspiration was the wall color that I chose, "Foxgloves" by Behr. It is the perfect purple-gray. It inspired everything that I put in the room and was the perfect color for all of the white to really pop. Girly, Glam, Eclectic, Vintage, and WHITE! All of the prints on her gallery wall are from Etsy shops. I bought her a Dimplekin Doll when I was pregnant and found out I was having a girl. I hope that we will have a collection when she's older. I also love the sequined hanger. I display all of her cute dresses on it. I added some Spoonflower wallpaper to the back of her ikea dresser and it looks so cute. I may wallpaper one of the walls. Items from Etsy shops make my home decor unique. It's great to have pieces that you can't buy in stores. This is beautiful. Definitely something I would do for my little girl. This is beautiful. Definitely something I would do for my little girl. Especially love the deer with gold antlers and the book shelves are my favorite!